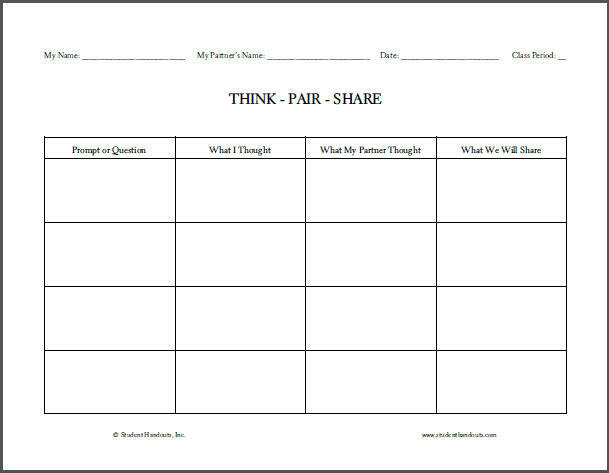 This is a worksheet for student note-taking during partnered classroom discussions. The teacher typically sets forth the questions for discussion. Each student gets a worksheet, and takes notes on his/her answers, as well as his/her partner's answers. The pair of students then decides what will be shared with the rest of the class. Why use this worksheet? This worksheet alleviates the problem of having only one student "do the work." By looking over these worksheets, teachers can make certain that everyone in class is participating, rather than just those students who are tasked with "writing it down." Click here for our free printable graphic organizers. Click here for our free printable ELA: English Language Arts worksheets.